Once I found out that we would be moving back into our home I got a little crazy and started to get rid of furniture that I had had enough of. I just didn’t want to have to move something that I really hated. It was functional but did not bring any beauty to our home. Of course that meant that I had to replace some of those things, like a futon that had been our couch for the last 6 years, with nicer versions. Having already lived in this home before I already had a list of things that I knew I had to change. At the top of my list were the super ugly light fixtures that are in the kitchen and dining room. In this picture you can see the old light fixture. I’ll admit it doesn’t look hideous in this picture, but that is because my renter’s took a can of spray paint to it. It used to be a bright brass color. I don’t blame her for doing it, I wanted to do it myself so many times and never got around to it. I don’t know what color paint it was supposed to be but it looks kind of like a poopy brown. One day while I was perusing craigs list, I came across the most awesome light fixture I had ever seen for $10. I convinced my husband that I just had to have it and we were off on an adventure. It was an interesting adventure that found us sitting in the parking lot of a shady hotel at 8:30pm with the manager of the hotel giving us scowling looks form the office window. I was sure he was going to call the cops on us for sitting in his parking lot in the dark! Thankfully we weren’t hacked to pieces by some psycho craigs list stalker and I got a beautiful light fixture (minus the glass shades) for $10. I made my smart aleck-y husband swap out the light fixture earlier in the week. I found the glass shades at Lowes for $8 each which made them more expensive than my light fixture. Still, at $34 it was a bargain and I love it. My husband thinks it looks pretty good too. 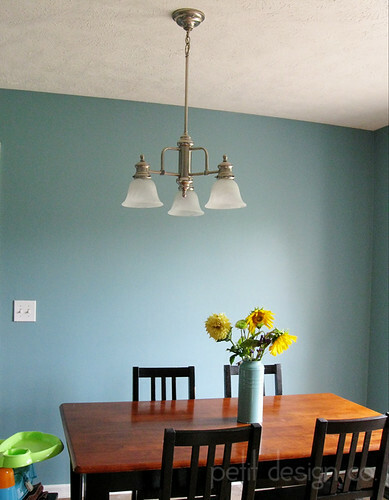 It’s amazing what an updated light fixture can do for a room. 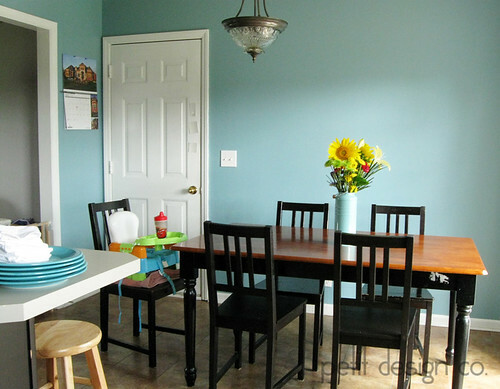 It drives me bonkers that the light fixture is centered in the middle of the room and not in the middle of the usable dining area, we have plans to fix that but I’ll save those for another day. I love it! I love the blue paint in that room, too!! It really brightens the room! Isn't it weird how builders can't envision a room in use and slap those lights right in the middle no matter what?! We had the same issue with our light. We finally had it moved...not cheap but worth it. Amazing how much it costs for a 20 min job. Ah, same problem with ceiling fans in bedrooms. They're always in the center of the room and look so odd when not centerd over the bed.